Denny Jump (Bellevue, WA, United States) on 8 August 2010 in Landscape & Rural. This view is from the western side of Merrill Creek Reservoir in western New Jersey. We are atop one of the 4 earthen dams that circle the lake. 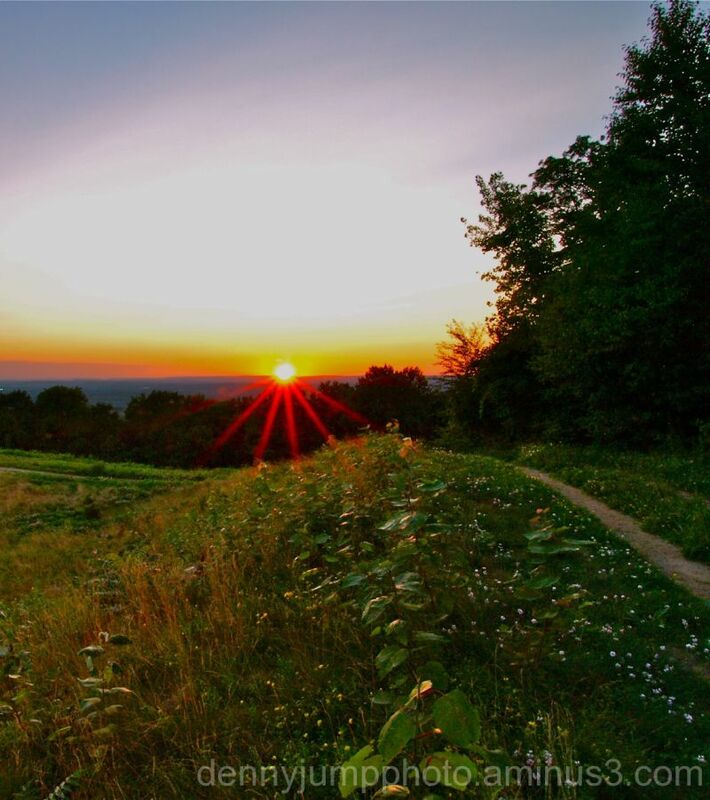 From this vantage point, we see Pennsylvania as "mister sun" rests (just for a brief moment) upon one of the many ridgelines that comprise the Appalachian Mountains as they traverse Pennsylvania. The Appalachians enter Pennsylvania in the south-central portion of the state and take a sweeping right-hand turn to eventually head east and enter New Jersey and New York state. As you can tell, the cloudless sky coupled with the setting sun provided some major issues when trying to capture the sunset resulting in a rather large sun star - but ir's all part of the experience as Clark Griswald would say. How cool is that??? Really nice. @Formerly Known as MontereyJohn: Hi John- Thank you very much! Great to hear from you and I guess I should say "Welcome to Waterbury" ... I hope everything goes well. Lovely shot..Well composed, the footpath leading the eye to the sun.. The sun rays are awesome..
@Sunder: Hi Sunder and I thank you very much - this was a challenging situation so thanks for the comment. @Scene by Sharon Photography: Hi Sharon - Thanks very much. The clear skies were rather unexpected but the skies were awesome red after the set - I have a few shots of that as well but this has more "eye candy" in it I guess :-) All the Best to you! Perfect composition with the path leading into the shot. I like the warm evening tones, and of course the star! laser rays of the sun, beautiful photograph. @Phil David Alexander Morris: Hi Phil - Thanks very much. I do appreciate it. Fantastic! I love the starry effect shooting downward, and the excellent, incredible light you've caught over the tops of the leaves. The composition is excellent!!! @Bettina: Hi Bettina and thank you so much. I really liked the 7th inning stretch you posted - great stuff! Those pretty red rays seem to be touching the plants with their warm light. This is a very effective photo. @Steve Rice: Hi Steve - Sorry to be late in responding- Thasnk for your comment and I am amazed at your post for today (Sunday that is) awesome! Denny this is a beautiful image; the depth and vibrance of colors and the sunset and sun rays are simply beautiful. Thank you for kind comments on my photographs which led me to your beautiful images. @steve loos: Well Thank you Steve - I really appreciate your comments. I had some challenges here at this scene with no clouds and a few other issues all related to forgetfullness :-) But it was great fun! Thanks again sir! I really love this shot! Nice job Denny, the colors are so cool! Hehehe, I love this spot! Yep, gotta love that bright red sun star. It adds a nice red-green complement to the image, makes it really pop. Nice shot!